Come to the circuit and live an unforgettable WorldSBK experience! The world famous WorldSBK Paddock Show will be offering even more entertainment to the fans this year. There are just a few weeks left before the 2019 MOTUL FIM Superbike World Championship season will kick off in Australia this month, and anticipation continues to rise ahead of the first round in history to be offering not two, but even three WorldSBK races each weekend. 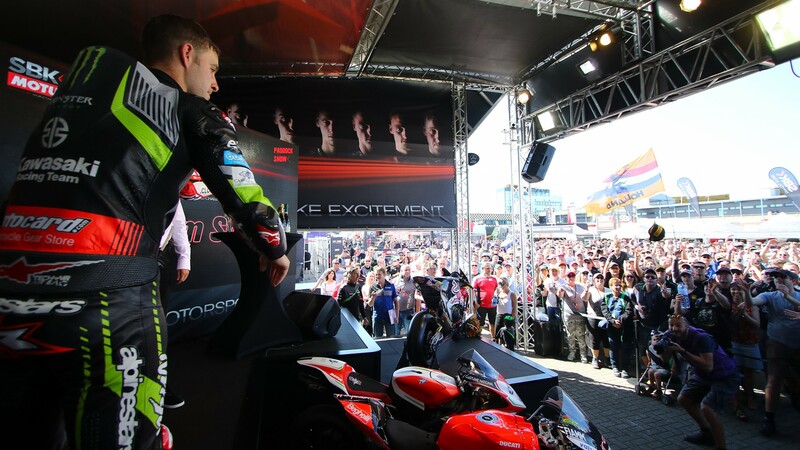 With the addition of the TISSOT Superpole Race on Sunday morning this year, fans will have plenty of on-track action to enjoy, and on top of that, the WorldSBK paddock will be offering even more entertainment to all the fans who will be attending the events track-side. Continuing to grow year by year, the world-famous Paddock Show will be the heart of the paddock allowing fans to get involved into the magical atmosphere of the race weekend, enjoying an unforgettable racing experience, and be part of it at 360 degrees. The 2019 Paddock Show will be bigger than ever before, and it will run for 8 hours a day from Friday till Sunday during all the race weekends around the globe. Live commentary of all the three classes will allow fans not to miss any single minute of on-track action wherever they are, and entertainment will not be over once the bikes will return to their garages. Riders will be on stage minutes after the chequered flags, giving their reactions and they will be available to answer all the fans’ questions. During the sensational SuperShow on Saturdays, fans will be able to meet their heroes, as all WorldSBK and WorldSSP riders, and the WorldSSP300 leading riders will be there to sign autographs and take pictures with the crowd. The Parc Ferme will continue to be welcomed into the Fan Zone allowing the fans to be particularly involved with the post-race celebration. On top of this, exclusive competitions and interactive quizzes will grant to the winners the chance to live unforgettable experiences, such as taking a walk onto the WorldSSP300 grid in that crucial moment before the lights will be out when riders will have just a few minutes left to concentrate. Concerts, charity auctions and other events will be taking place at the Paddock Show over the season making the crowd playing an essential part of the show and in the story of WorldSBK. Enjoy exclusive videos and reactions coming from the stage of the Paddock Show, all with the WorldSBK VideoPass.